The Airbnb listing for this unique retreat with the Adirondack Mountains and lakes as a backdrop offers a castle to match your fairy tale. 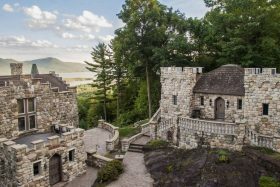 Located in Bolton Landing, New York, Highlands Castle, the larger, grander fairytale venue next door, was featured by 6sqft in 2015 when it was listed for sale for $12.8 million. The entire property is the work of one John Lavender, who built the magical castles a mere 30-some years ago complete with knights, turrets, life-size lion statues and secret passageways to make good on a promise he’d made to his three-year-old son a decade prior that he’d build him a castle. The same #1 dad is offering the mini-castle on the property as an unforgettable mountain-country escape. A new owner has claimed the stately Great Camp Uncas compound, nestled among the Adirondack forest and lakefront. 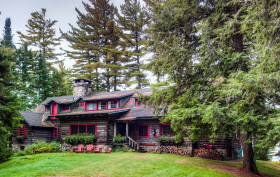 The secluded property was built in 1895 by Brooklynite William West Durant, credited with perfecting the style of the Adirondack Great Camps of the Gilded Age. This particular camp—at 1,500 acres—was impressive enough for financier J.P. Morgan to purchase it in 1897. It was used as a vacation home for him and his family the next 50 years. Since then the property has traded hands several times, and a parcel of it last hit the market in 2015 for $3.25 million. An unsuccessful sales run caused a price drop, in 2016, to $2.7 million. According to the brokerage firm Franklin Ruttan, one lucky owner has snapped it up. The Hedges of Blue Mountain Lake is a family camp compound in the Adirondacks dating to the 1880s. The 12+ acre site, with its 1,600 feet of waterfront land, private beach, two docks, tennis court, and 21 buildings, recently hit the market for $4.25 million, as first spotted by the Wall Street Journal. Though the summer season is already well underway, the income-generating property is offered furnished, so the new owners could get some vacation rentals going in no time. If you’re looking for a unique summer retreat not far from NYC, here’s your answer. 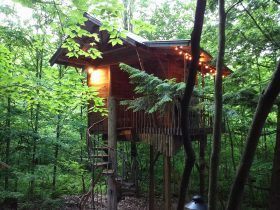 This cozy treehouse is nestled in the foothills of the Adirondack Mountains, nine miles from the upstate town of Saratoga Springs. In this quiet, remote locale, a winding staircase takes you from a patio up the tree and into a wood cabin. It’s outfitted with everything you’d need, including a bathroom, lofted bed, and built-in storage. And right outside the sleeping quarters is a covered porch perfect for reading or writing. For such a quiet, private retreat, it’ll cost $179 a night. A standout even among the region’s Great Camps, the secluded Camp Uncas was built in 1895 by Brooklynite William West Durant, who is credited with perfecting the iconic Adirondack Great Camp style. The compound’s biggest claim to fame, however, is that it once belonged to financier J.P. Morgan, who purchased the 1,500 acre property from Durant in 1897; for the fifty years that followed, it served as a vacation home for Morgan and his family. Though the property has traded hands several times since, the appeal of its iconic architecture remains as compelling as its history. Designated as a national landmark by the U.S. Department of the Interior in 2010, this historically significant piece of the Adirondacks is for sale for $2.7 million, reduced from its original 2015 ask of $3.25M. The listing calls this “a private hideaway for those who seek the finest craftsmanship and location.” For sure, the house at 553 Hawk Ridge Road, nicknamed Camp Big Rock, is pretty special. It’s located on 30 sprawling acres near Saranac Lake, up in the Adirondacks. The modern house, designed by the architect Shope Reno Wharton, was even impressive enough to land on the cover of Architectural Digest. 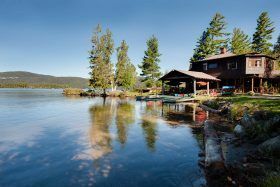 And there is so much more than the home: the grounds include a boathouse, beach cabin, guest house, barn, gym cabin, caretaker’s cabin and tennis court. There’s no “roughing it” here. This is the luxurious day camp of your dreams. You can now own a piece of the Adirondacks that has provided serenity for so many others for over a century. 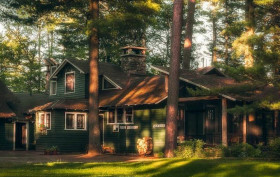 The secluded Camp Uncas was built in 1895 by Brooklynite William West Durant, who is credited with perfecting the Adirondack “Great Camp” style. While the compound is unquestionably a spectacular work, its claim to fame is that it was once owned by financier J.P. Morgan. Morgan purchased the 1,500 acre property from Durant in 1897, and for the fifty years that followed, his family used it as a vacation home. Though the property has traded hands several times since the Morgans graced its grounds, its roster of owners is no less interesting—nor is its rustic architecture. If you need a few days out of the city to disconnect from the world and reconnect with nature, we can recommend a gorgeous spot in the most magical of pine-scented locales. Situated right in the heart of the Adirondacks and immersed in a forest of majestic trees, the White Pine Camp is a lovingly restored, historic accommodation built by the rich and powerful of the Gilded Age. Featuring a number of cozy cabins and cottages for rent, this rustically grandiose retreat also once served as the secret summer house of President Calvin Coolidge.